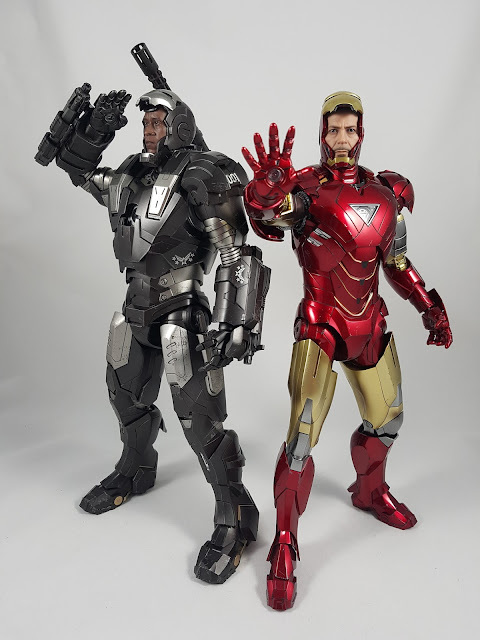 After realising how underscaled the diecast Iron Man Mark 3 figure was in comparison to the more recent diecast War Machine Mk1, it was a no-brainer for me to get the new Hot Toys diecast Iron Man Mark 6 figure. The War Machine and this new Iron Man complement each other perfectly. 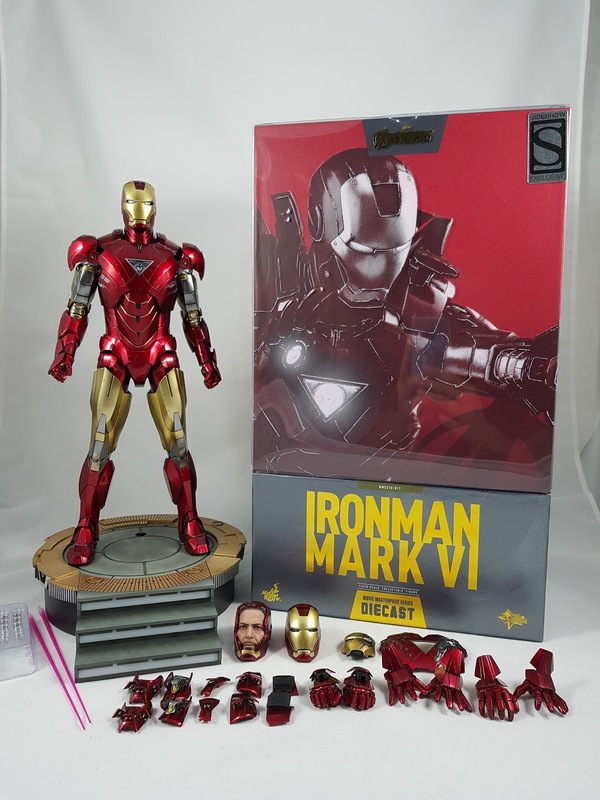 The box art and packaging design is the standard style for the Hot Toys diecast figures. The out slip box covers the foam interior that houses all the accessories very well. This set comes nicely decked out with all manner of swap out armour parts and head sculpts and a diorama base. The only thing I wish for would be a totally unhelmeted head sculpt. The Sideshow exclusive accessory is a head sculpt that has a light up blue feature. I've been told it's from the scene in Avengers where Thor attacks the Quinjet, and Tony Stark grabs the helmet to wear just before he goes out to attack Thor. It's a very brief scene, and the exclusive seems rather pointless. 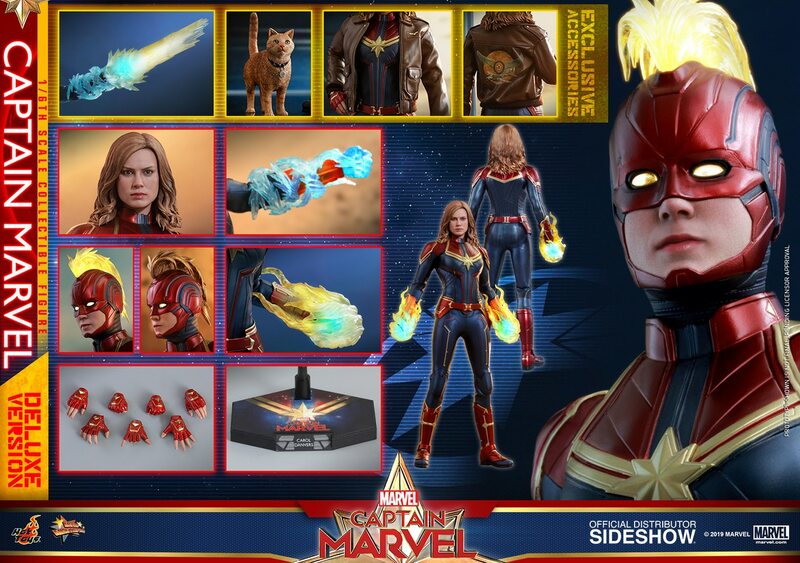 If you're getting this exclusive from Sideshow for no extra cost then that's OK, but I would not recommend paying extra for it from HK just to get this additional headsculpt. 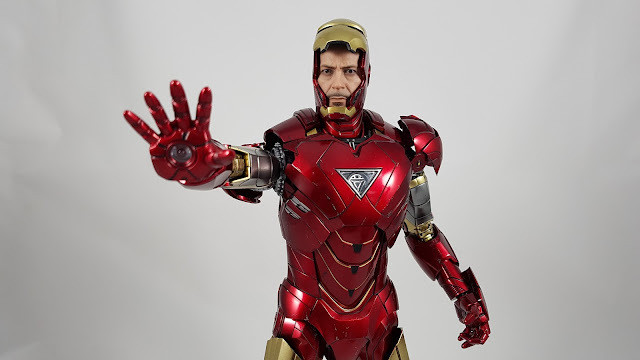 There are so many swap out parts for battle damage and hands to replicate pretty much any scene from the movies. The unmasked head sculpt is fantastic, with a great likeness and extremely realistic facial paint application. The light up features are also plentiful, but I didn't even bother trying to put all the batteries in. I've tried that with the older Mk3, and that was an exercise in frustration that I just didn't want to repeat! Needless to say I always display my figures without batteries, and I would hate to leave batteries in and have them leak! Even without batteries, the figure still commands a lot of presence on display, and looks amazing from almost every angle. The War Machine is still just a tad larger (those WM feet are a little ridiculously big I think), but displayed together they scale quite well, unlike the Mk3 that was quite a lot smaller. The paint application on the armour is superb, with just the right amount of battle damage that can be supplemented with the swap out battle damaged parts. All the joints and moveable parts seem fairly firm, with nothing overly tight that needed excessive force. I would be careful swapping out the hands though. Mine were quite tight and needed some hot water to soften up. I'd definitely soften them, and be careful where you place your fingers on the forearms when swapping out hands - do NOT place anywhere on the armour with excessive force in case you snap something off! The articulation is amazing for such a complex figure. Nothing seemed overly fragile, but the creaking of the joints as you move them does scare me. From what I've seen, it's definitely a massive improvement over the original plastic figure release. The ankle articulation on the War Machine was done better in terms of rocker motion, but overall the articulation in both is fantastic. For fans that are on the fence, I'd highly recommend jumping off and ordering this straight away! These Iron Man figures are generally pretty sought after and get very difficult and expensive to buy once they sell out at retail. With these diecast Iron Man figures, I don't think you can really make a bad call on getting them!